It's fuzzy, it's oversized..I'm in love! We know how chic oversized is right now. It's easy and effortless and modern. I also have always had a soft spot for fuzzy sweaters/cardigans/jackets. They are fem and glam,and when oversized, have an ease that you just cannot not love! Man I love my local vintage shops. This entry was posted on Friday, December 6, 2013 and is filed under black,vintage,yellow. You can follow any responses to this entry through the RSS 2.0. You can leave a response. Cool look, you must be freezing taking these shots though! Love the outfit, love the yellow, love the "fuzz." And BTW - holy leg muscles!!! Yellow is a colour we don't seem to be seeing very much of right now...and I gotta say, I like it!! Of course, the fuzzy factor paired with the contrasting leather pieces is a bonus; just another fabulous look!! You always seem to score really great thrift items! Love this outfit, you look cool and chic! 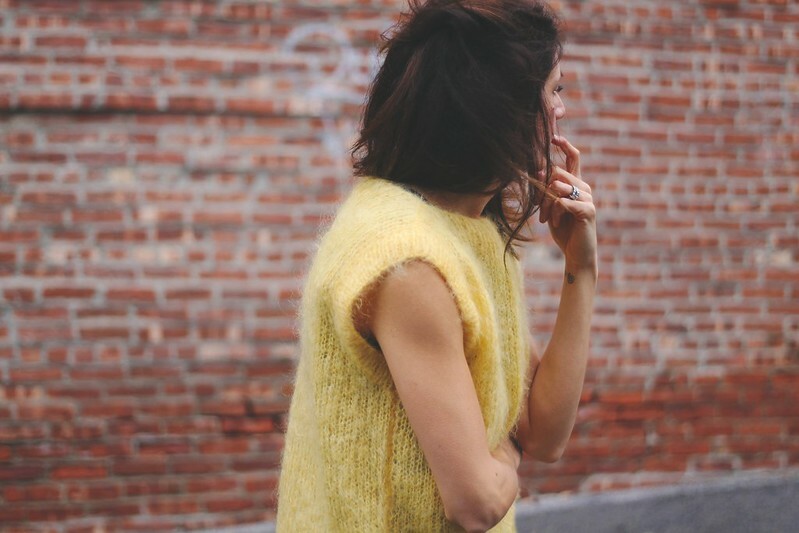 This yellow vintage sweater is awesome. You look beautiful as always. You look beautiful, but ... Are not you cold, so wearing in New York? You are getting so much good stuff lately me, you & Denise MUST reschedule our bday day & maybe just hang in Beacon!!!! Definitely cannot not love. Yellow looked so good on a dull day. This is a serious score! LOVE.